Academic milestone at the Sutherland house: Tate is now a kindergartner, meaning all three kids are now in elementary school. 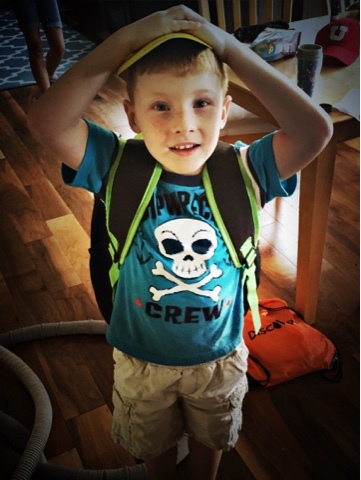 First day of third grade. 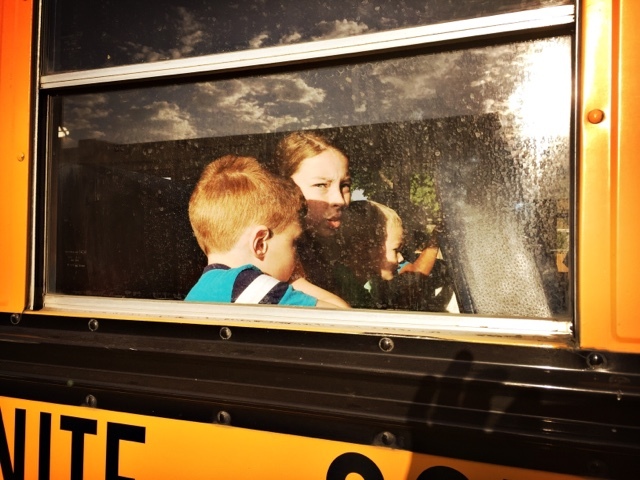 First day of fifth grade. Traci and I don't take a lot of kid-free vacations. If my math is right, we've only spent one night away from the kids since was Tate was born five years ago. 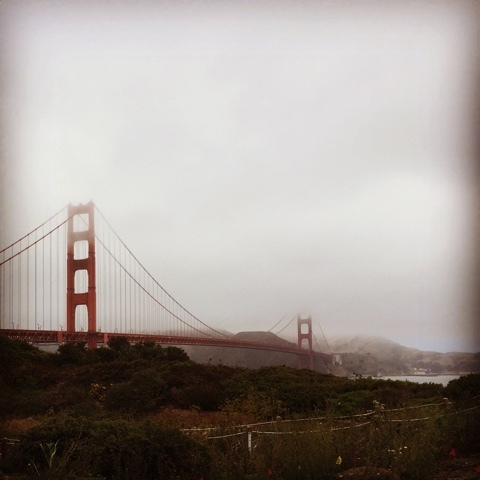 So when I had the chance to go to San Francisco for a work conference, Traci and I decided to go a couple of days early and make it into a mini vacation. We covered a lot of ground in the 30 hours we had together. 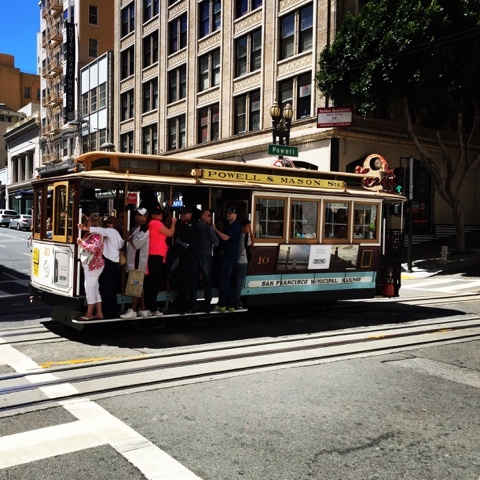 When you're in San Francisco, you have to take a ride on the trolley, right? Unfortunately, on a Sunday afternoon at the height of tourist season, that means standing in line for an hour-and-a-half. After about 45 minutes, we decided that we didn't want to spend our whole trip waiting. We were about to throw our $14 tickets away when the conductor said, "We can fit two more on this one." Traci and I jumped over the rope, past the 100 people in front of us and declared, "There are two of us!" We were then shoved inside the middle of the car, where we could see nothing but the bodies pressed next to us. We'll take the tram next time. 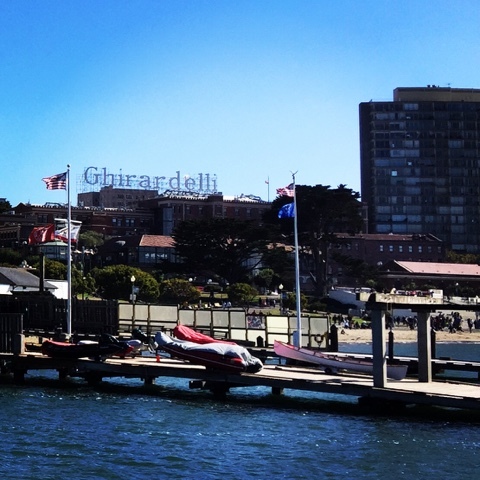 But the trolley was good enough to take us to Ghirardelli Square, famous for its chocolate ice cream. We took one look at the ice cream line — which was nearly as long as the line for the trolley — and decided to move on. We settled for the Ben and Jerry's shop down the road. No complaints. Our original plan was to take the trolley back to the hotel, but we figured we would could walk all way to the hotel in less time than it would take to actually make it to the front of the trolley line. 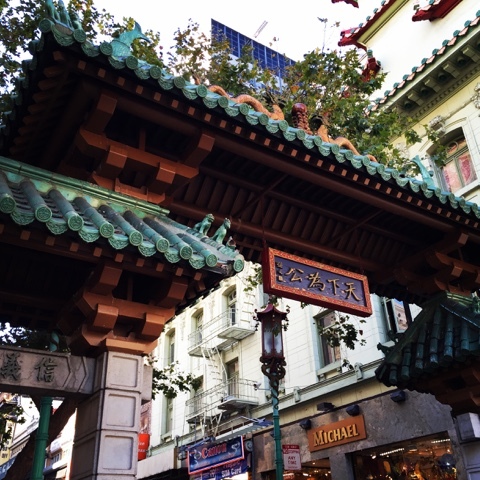 We had a lovely stroll through Little Italy, Chinatown, and what I like to call the Convenience District. 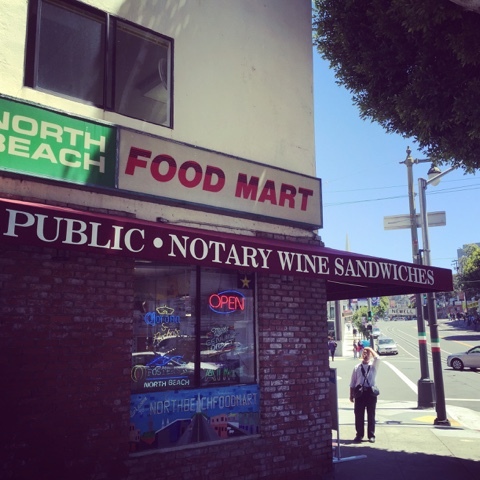 Who knows when you're going to need a sandwich, some wine, and a notary public all at the same time? 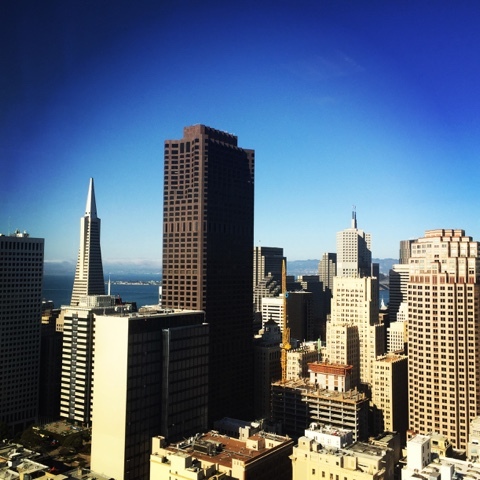 San Francisco, you've got it all! By the time we made it back, our feet were pretty tired but our spirits were still high. We went to Uncle Vito's Pizzeria for dinner, which resulted in more waiting. I tried to pass the time by eavesdropping on the conversation the Dutch hipsters were having two tables down from the waiting area, but I couldn't really hear what they were saying. For the first few years after my mission, I was pretty bold. If I heard someone speaking Dutch, I'd march right up to them and join in the conversation (uninvited). These days, I'm not so confident about my Nederlands. I'll usually still chat with Dutch people, but in English. After what seemed like forever, we were finally seated in a three-table section upstairs — right next to another group of Dutch people. 'Tjonge jongen! Maybe it was the hunger talking, but I was brave enough to speak to them in Dutch. It was a little clunky, but I felt like I held my own. I was proud of myself. 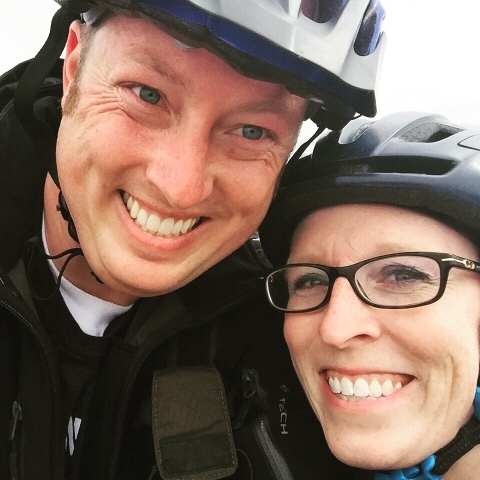 The Sutherlands have never been widely known for their adventurous spirit or love until the outdoors. Until now. Traci and I decided to rent a bike and ride the eight miles from Fisherman's Wharf, across the Golden Gate Bridge, to Sausalito. Outside of the rental shop, we were still a little uncertain. "Are you sure want to do this?" "Um, yeah. I mean. Yeah." 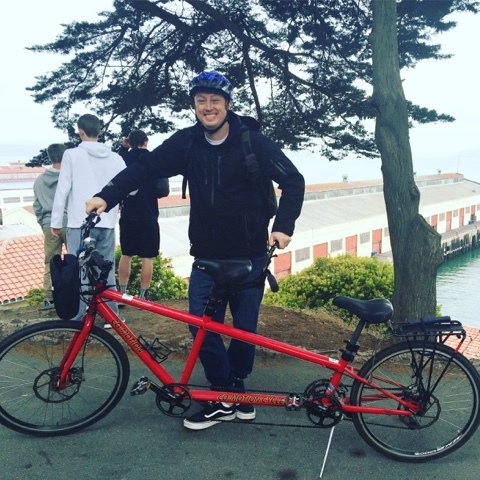 We figured a tandem bike would be the best option. The first 20 minutes of the 90-minute trip were a gentle ride along the bay. Despite the chilly wind, it was refreshing and quite lovely. Next came the steep, windy, winding trip from the bay up to the bridge. It was hot and sweaty and yell-y. Traci: Why do you keep shifting? Me: It's not me, the gear won't catch. Me: We're never going to make it. Me: I'm pretty sure I'm having a heart attack. Traci: I'm kicking into spinning class gear! And zoom! Up we went. Once we made it to the actual bridge, the ride was much easier — though it was hard to not run into/over the throngs of bridge walkers or get distracted by the suicide hotline signs posted every few hundred yards. After about an hour, we had made it to the other side of the bridge and were able to enjoy the descent into Sausalito, which was absolutely gorgeous. Our legs were tired and our butts were sore. But we made it! 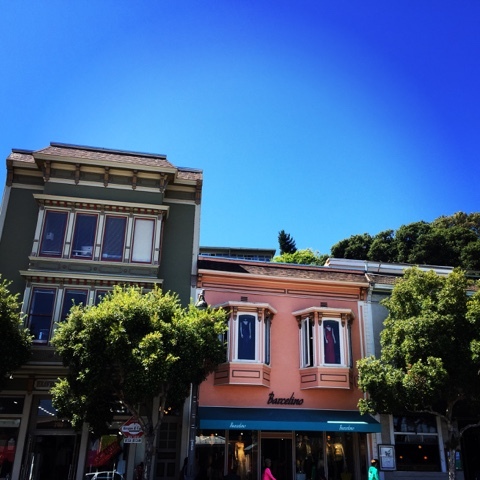 We rewarded ourselves with a delicious lunch and some window shopping in Sausalito and then took the ferry back to Fisherman's wharf. Back on dry land, we needed to get from Fisherman's Wharf to the hotel to get ready for Traci's flight home. We decided to walk again — taking almost the same route as the day before. We had no idea that by choosing one street over we would forgo the relative flatness of the prior day for an enormous, hilly climb. By the time we made it back to the hotel, we could barely move. Throughout the day, we'd been following the airline news. A power outage in Atlanta resulted in all of Delta's computer systems going down, which then led to the cancellation of hundreds of flights and delays for the rest. My wish almost came true. Right as Traci was about to step into the airport shuttle bus, the Delta app dinged and said the flight was delayed two hours. That gave us just enough time to eat dinner in Union Square. Thanks for the bonus time, Delta! Traci's departure meant that I actually had to start working. 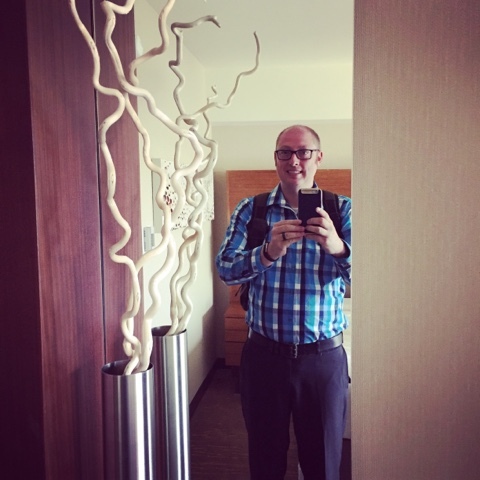 I ironed my pants, tucked in my shirt, put on my backpack, and marched off the social media conference like a big boy. At the end of the first day of the conference, there was a networking event with hors d'oeuvres and drinks. I skipped it so I could watch baseball. Despite being directionally challenged, I was confident that I could find my way to the Oakland Coliseum for the A's game. I made it to Oakland without any problems. Sure, it took me three tries to figure out how to print my ticket and I had to ask for help to find the right train, but I was feeling pretty good about my navigation skills. Twenty minutes later, I stepped out of the train, bought a ticket from a scalper and headed for the first stadium entrance I could find. When I walked in, I realized I hadn't gone in the main entrance. Instead, I was in the concourse behind the suites. And apparently, my scalped ticket gave me access to the Jewish Appreciation Night dinner. The next thing I knew, I was eating a free hummus wrap with some very friendly Jewish folks and listening to a klezmer band. Currently in last place in the division, the A's are not much of fan draw these days. The Jewish section, however, was nearly full. Not only did that mean that I got to sit by a lot of very nice people (the Israeli girl with a piercing on the skin above her teeth shared her peanuts with me) but I made it on the Jumbotron as well. The trip back to San Francisco wasn't quite as smooth. Knowing my tendency to get lost, before I left the hotel, I specifically asked the concierge how to get back from the game. "Oh, it's easy," she assured me. "All the trains head back to San Francisco." I found the station. Sweet. I found my the platform. Yes. Trusting the concierge, I took the first train I saw. I was so proud of my navigation skills, I didn't even bother wondering if I was going the right direction for a few stops. That's when I decided to take a quick look at the map. Nope. Not going the right way. Going the entirely wrong way. Knowing I was in trouble, I asked a very nice couple for help. They told me I could just take the next stop and head the other direction. (Rightfully) not trusting myself, I instead rode a few stops further and transferred when they did to make sure I got to the right place. BART, you may have won this time. But I'll be back. After the second day of the conference, I decided to stick a little closer to the hotel. 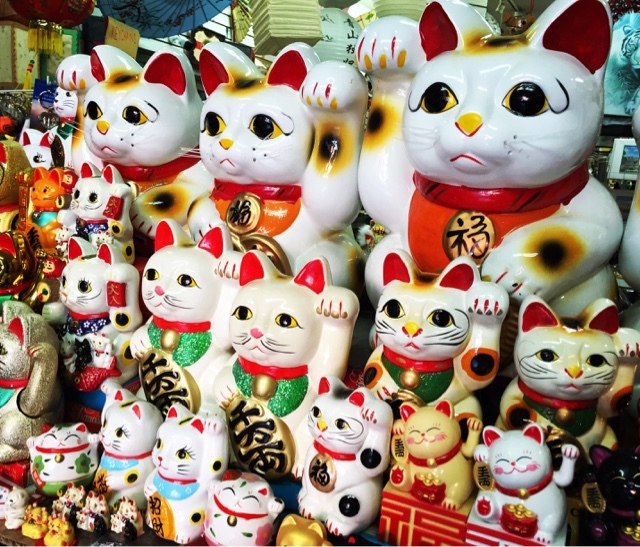 I had a lovely stroll through Chinatown. I couldn't resist buying some knockoff Golden State Warriors t-shirts (for the boys) and a solar-powered waving-kitty (for myself). Then I forced myself to leave because I kind of wanted to buy everything. Then, just like that, the trip was over. Though it was short, it was great to spend some alone time with Traci. It was nice to step away from the office and get a bit of creative fresh air. And it was great to wander around the city and find some inspiration. SLC to SFO. Kid-free vacation.